The best attribute for me ! Stop loss + Take Profit + Close + Position centric (Number of successive trades on the same asset) so Martingale (or Pyramidal). 1- Not a martingale, not a pyralmidal strategy ! One trade at the SAME time so one asset at the same time. The Loss Aversion Attribute is the best IA for me...and for you ? I can fully agree, for investing it is the most valuable attribute if you don't want to run into unpredictable losses by the strategies behaviour. I my opinion the truth is more related to Rs algo, but La completes the picture. I think this is an interesting IA, my Darwin scores quite well on it anyway ... but not sure whether holding losers longer than winners is the best proxy for loss aversion per se. I'm more interested in whether a trader is trading without stops or loosening their stops when they are supposed to get out! 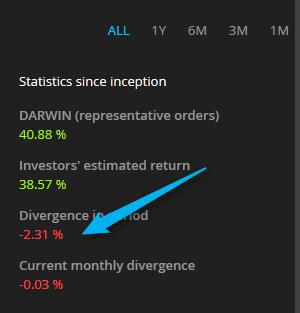 Lost nearly 40% of an investor account due to a Darwin provider trading without a stop. Closed position as soon as I was told this was what he was doing. He came back, but for me it wasn't worth the risk. He was picking bottoms in a powerful down trend without a stop. This is not an investable attribute. Scary thing is he was / is managing a couple hundred K. Felt quite let down by the trader and Darwinex algorithms at that point, but it was only a small account so shrugged it off. You are a fan of La score so I want to discuss with you a bit more in the right place. Let's consider these 2 darwins. I assume PLF is downgraded on La currently with its last long drawdown, but that wasn't the first one. Before the La attribute should be greater than 3. What makes me more suspicious with it is the Cp attribute and the negative Divergence estimated to 50 % of the trades. Can you clear this point? I assume that the high number of investors made money with PLF. In my opinion DZT delivers much better data, even if it is younger. The only point I don't understand is why PLF is funded with realy big money and DZT with only $ 400. Trading a significant proportion of XAU with it should require a better funding, if the trader trusts hist strategy, but I don't know the trading style and whether it is enough for it in normal situations. VaR is kept to about 10% with this deposit. Here we should speak about Loss Aversion, not about divergence or Capacity. Going back on track about La. La makes much more sense than R+ R- or Os Cs but remains a strategy-dependent attribute. A low score often means a strategy that needs average losers bigger than average winners to work. If you look to evolution of score chart you will find that La ranges from 3.3 to 2.6 for PLF . This is true for all strategy dependent scores, not the higher the better but the usual the better. You're completely right, I should reduce my opinion about the points I see on a higher priority. Without a scientific reason: On my filters I usually have an La of 5 or even 7, on one filter I used 4, but never less. To me it looks like there is no idea when a loosing position should be closed if I see an La of 3 or less. I know that that must not be true for a Darwin, but I assume that it would not be a good timing to invest if the La attribute weaken slightly. I dont' want to disclose too many details about my main filter because I hope to "provide" it when it will be possible. There is a big difference between long stops and no stops. You are very right about that. If longer stops, than smaller position size is needed and LA is showing that stability and also algos won't increase Darwins position size because you have stable Var which has slighlty wider range. Traders who use the same position size in all market conditions and with very variable stop-loss placements than it is for an investor much harder to spot if a trader is using stop-loss or not. And for me personaly this kind of strategy is less attractive and much more trading history is needed to trust it. In any case, if you are a day or a swing trader, stop-loss placements get a pattern if you stick to the rules. LA and Max. +/- excursion per trade shows that. I like to see distinct line where the trader is out. Not 2 as you wiil have seen. But JJY is different that XXR on the same 8.7 Loss Aversion. JJY is Average positive excursion/Average negative excursion = 1.5 Tooooo !! And yet not the same Loss Aversion. The AVERAGE is limited by the impact of the Best/Worst positive excursion, not the MEDIAN. @juancolonbo @ignacio could see the MEDIAN and make progress the IAs ! A rough rule is a rough rule: a thumb rule. It doesn't substitute a chart and 10 different values. Reverse engineering the algo wasn't my aim. With 1300 darwins it's easy to find some exception. 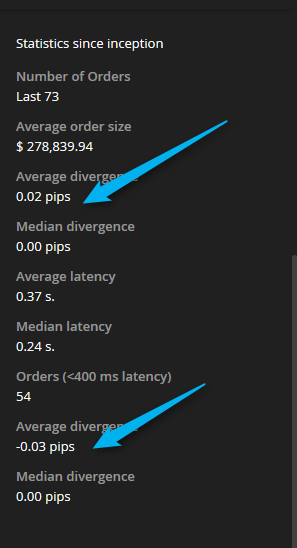 Excrusion is definiate one of the key attributes people should look at, I have seem a lot strategies having very good average win/avergae loss ratio well above 1, but tends to hold negative -600 pips to win 20pips, just got lucky for even up to 2 year history that all its -500 -600 negaive excursion got back up and closed at only -30 even end up positive. Such ones will eventually fail big, before long...the longer it got lucky for, the sooner judgement day comes. Very dangerous if just at closed trades' stats. I doute too long stop types could last for long, even if they can, still donot like it. Something more usefull than La score is its evolution. If La is unstable it can mean inconsistent trading. Charts of style attributes (OsCs, La, Cp) are very useful to understand if the trackrecord is composed by more strategies pasted together. 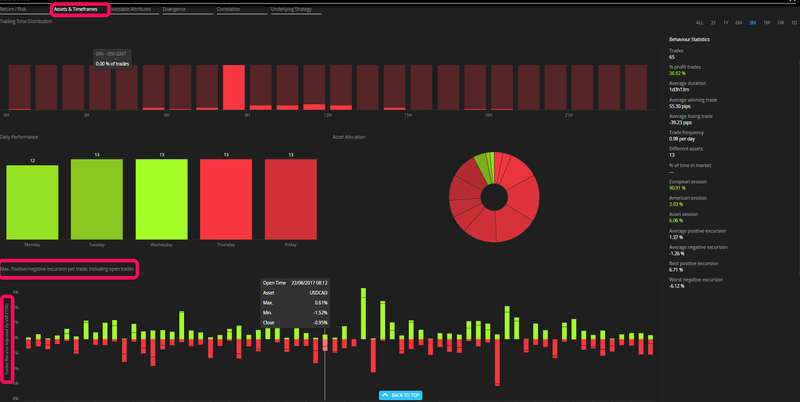 I´d like to drop a line in order to shed light on both our La investable attribute chart (Max. Positive/negative excursion per position) and the Max. Positive/negative excursion per trade chart. First of all, it is very important to distinguish the difference between position and trade. For those of you that aren’t 100% familiar with this, please click HERE. 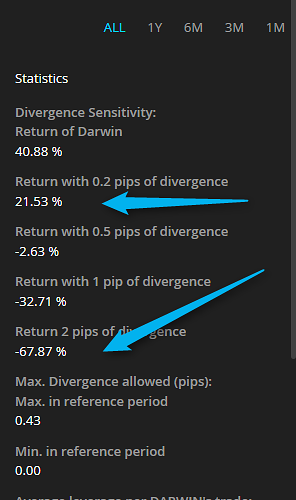 In case some of you might be wondering that the results reflected in the above-mentioned charts does not add up with the ones reflected in the Darwin, please be aware that these are % calculated without taking into consideration any risk adjustment taken by our risk manager. In conclusion, both of them are merely position/trade returns adjusted by VaR. We consider this to be is the only way we can draw the conclusion whether a trader suffers from loss aversion or not since the intervention of our risk manager could hide this sort of behaviour.